Cupcakes 'n Daisies: It's Tuesday . . . .
and you know what that means. . . . It's Eventide Update Day !!! Wow, I can't believe this is the 6th sew along update, where has the time gone! Next week will be the last update before the Eventide Parade on April 5th. I was waffling on whether to post pictures of the finished projects as they came in, then I decided sure, why not. Hopefully seeing the finished projects before the parade will help and motivate those not quite done, plus, who can see too many pictures of beautiful finished quilts, we'll show them again in the parade. "I finished my Eventide and I really like the way it came out. I auditioned a light versus dark border and decided I liked the dark border better, it almost provides it with a frame. Glad that it's done, but had a really good time working it with the rest of the gals"
Great job Deb, those Jo Morton fabrics worked out wonderfully, it's a beauty! And that red inner border, perfect! So here's my finished Eventide which I have named, "Dancing with the Devil in the Pale Moonlight"
For as much as I struggled with my fabric choices and placement, and worried about my bold red and browns, I could not be happier with how it all came together. I'm particularly happy with how it takes awhile for the large blue star points to catch your attention. I would have never made this quilt had I not seen it in person, but I'm so glad that I did, I just love it and think it's a wonderful addition to my other quilts, a breath of fresh air! We have a newcomer to our sew along, Marianne doesn't have a blog, but after reading our updates every week she couldn't sit on the sidelines any longer. Marianne is using Garden Party by Blackbird Designs for Moda. Another great fabric choice for Eventide!! I also heard from Peggy R, who doesn't have a blog but does have a finished Eventide! She promised a picture before the parade. Congratulations Peggy, I can hardly wait to see your Eventide made with Gatherings by Moda. Gayle has finished the center of her project and plans to add two borders, a medium colored border, then a darker colored border, no pictures yet, next week for sure. Gayle has an extra Eventide pattern and would love to pass it along to someone who doesn't have one. The first person to leave a comment asking for the pattern gets it! The early bird catches the worm, or in this case, Krystena gets the pattern! Becky is at that tricky point in the project, she has everything all cut out, but is not sure how to sort it all. Hang in there Becky, you'll figure it out! That French General fabric is going to make an amazing Eventide, that fabric can't make an ugly quilt! If you're still struggling, maybe reading Nicole's blog on how she sorted her fabric will help. Judith has finished her Eventide using Roses the Noel. Judith, it's just lovely! And when I say done, I mean pieced, quilted and bound! She's looking for a new name for her quilt, maybe you'll have a suggestion, she's offering a prize! Gretchen's made some serious progress on her Eventide using some pretty Fig Tree fabric. Great job Gretchen, your project just sings, "spring". Bea usually has a Tuesday update, the last time I checked in, she was working on her hour glass units for the inner border. Brenda's got her Eventide cutting done too! 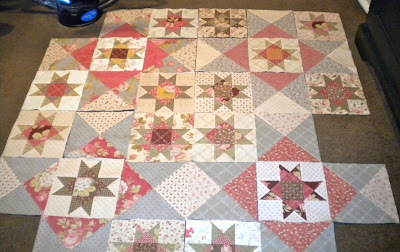 Sherri's working away on her Eventide pieces for the Ohio Stars, there's just something so appealing about a pile of pretty quarter square triangle blocks, just waiting to be pieced. Paula started feeling well enough this past week to work on her Eventide, her design wall is full and she has just a few more blocks to piece. Our other Sherrie has a new portable design wall and the first blocks on it....her Eventide blocks. Great Start Sherrie. You have to go through some amazing pictures of the Dallas Quilt show before you get to her blocks, how great is that! I'm not sure if Sinta, Nicole, or Lisa have an Eventide update, they've been very busy girls, but they always have something interesting going on so it's definitely worth a stop by their blogs. We have a winner from last week's update, Paulette, from Sweat Pea Quilting, these latest Schnibbles patterns from Carrie Nelson for Miss Rosie's Quilt Company are yours! Send me an email with your mailing address and they will be on the way to you. Thanks so much for following our sew along. I don't know about you, but I'm having a hard time deciding which new Schnibbles to make first!! This week's sew along winner is Becky - The Quilting Book Lady! Becky, you get to pick from the following, a fat eighths bundle of Charlevoix by Minick and Simpson for Moda OR a fat eighths bundle of Pom Pom de Paris by French General for Moda. What Becky doesn't select you can win, leave a comment on this post by midnight, CST Wednesday, March 23rd to be eligible to win. If I missed your update this week, just drop me a line, I'll be sure to add it next week! Thanks so much for participating in or following our Eventide Sew Along!! Thelma, Eventide looks wonderful! You've done a fantastic job, as always! And you have led your quiltalong very hospitably for us lurkers - I have enjoyed watching everyone's updates and seeing the different versions come along. Oh Thelma I would love the Eventide pattern! I have been so inspired by your quilt a long! I really love your fresh version and the wonderful Deb's top.I enjoy every week to see each blog's update. Not enough time to sew my blocks together this last week, but I 'll be ready for the next ! Oh, these photos are such a tease!! Congrats paulette!!!! I wish I could have done this sew along too but I am sure having fun sewing the results lol! Your quilt turned out really nice and it does take a moment to notice the blue stars - it's beautiful. I can hardly wait to get mine quilted now. Thanks for all your hard work on this project. I love the updates. Really makes me want to persevere. I am having a hard time with the sorting so I will check out Nicole's blog. I forgot that she did a post about the sorting. Thanks for the reminder. I love your finished quilt. Another great update. Congrats on those finishes! They all look outstanding!! Now I'm off to check out the other blogs for updates too. Thanks again for doing these updates! I love seeing the quilts in progress. What a surprise to see my name as a winner!!! It put a smile on my face and a new resolve to get through this sorting issue. I'll reread Nicole's post to see if it helps. I'm having a day at home. Planning to spend lots of time in the sewing room. I absolutely love both fabric lines, but have a weakness for French General fabrics. I'm already thinking of a new project for Pom Pom de Paris. Hope you have a day with lots of sewing! Thelma, I just love Tuesday mornings! The parades are wonderful! I won the Eventide pattern in your giveaway about a month ago, and because I had a number of projects going at the time (both quilting ones and family ones), I did not join in on the sewalong. But when things settle down, I am definitely making this quilt! I have not yet seen one that I don't like!! Any color combination seems to work. Congrats, Becky! Hope to see your quilt in person soon. I have so many projects on my wish list, but this one has just been added. Now to decide what fabrics to use. Thanks for the chance to win Charlevoix!! Congratulations to Becky!! This pattern is so pretty. Love how the different fabrics give Eventide such a unique look. I'm sure the parade will be fabulous! I love how Eventide seems to adapt to the personality of the fabric grouping chosen. Yours is just stunning Thelma and I love the Roses de Noel version .... I want to make this someday! Oh how I love Tuesday morning ! Thelma your eventide is gorgeous ! It has been SO much fun watching everyones progress on this Amazing quilt ! I love the Tuesday Eventide updates! Brightens the whole week! Becky is super lucky (and I can't wait to see her goodies in person. I'm lucky she is my friend IRL). I will be Eventide bloghopping this afternoon. The quilts are beautiful. I really want to do this quilt someday! You have done a great job showcasing this project. I'll take a chance on the "leftovers" from this weeks giveaway! Thanks! Thelma . . . I just love how your Eventide came out . . . that touch of blue is just terrific . . . you always come up with something different . . . I love waiting to see what you will do with a new project !! and the name . . . wow . . . sometime I would really like to see you post on how you choose the names for your quilts . . . I think that would be so interesting . . .
thanks for such a great blog . . . I so enjoy it . . . Your quilt is lovely! That pale blue just sneaks up on you--so much else going on, but it is the perfect soft color, and it all looks just great together. I'm putting this pattern on my mental list of quilts to do! Looking forward to the finished quilt parade! Great update! I loved looking at everyone's progress. Beautiful work out there in blogland. I found your blog through Sherri's (Quilting Life) updates. Are you going to do another sew along? I wouldn't be able to tackle a project like this without support. I like how everybody explains their fabric choices and their block placement. I am a beginning quilter and I am learning much through the updates. What wonderful, wonderful updates...love yours...the colors are great...and you're right, I really like how the more you look at it the more you see. Your version is just amazing Thelma. You were so full of heart to use the red in the large hour glass blocks the way you did. And it makes the quilt! You are so right how the light blue kind of sneaks up on you in that secondary pattern. A beautiful, beautiful finish! I love how Carrie Nelson's patterns can be interpreted in so many different fabrics and color combos. Each one is an original piece of art. Thanks for the quilt parade. It gets me inspired. These are so gorgeous! Thanks for posting the photos. I think I need to make one someday! Those are some beautiful quilts, I need to get busy. I WON!! I WON!! Almost fell off my chair reading your post this morning!! Thanks so much Thelma!! I will put them to good use...LOVE Schnibble Patterns..and I have none of these!! Wahooo! I will email you my address! Thanks so much! Beautiful quilts! I'm still waiting on my pattern to arrive in the mail. I don't know that I would make this quilt if I hadn't seem pictures of it. It's beautiful no matter what fabric you use. Every time I see your update, I kick myself for not participating. This pattern is gorgeous in all the colorways! It is so enjoyable to see the same pattern made in so many different fabric lines. It is a good thing no one has to pick a winner, for they are all gorgeous! Thanks for the compliment. Yours and Debs are both also very beautifull in their own colorway. Looking forward to see more finished tops. I really love all the quilts coming in, showing the marvalous progress on Eventide! I never think mine compares... but we'll see when it is all said and done! Thelma, your Eventide quilt is gorgeous! I can't wait to see the rest of the finished quilts. I will definitely have to add this to my to-do list. Carrie's patterns are the BEST!!! Just seen the Eventide pattern - hadn't realised what a big quilt this is - lots of sewing! Loved The Eventide quilt show. I am intrigued with schnibbles since learning about them from your blog. Always happy to win a prize. Your quilt looks gorgeous! So does everyone elses's too. Funny how our fabric choices change the quilt. Looking forward to the parade. I love all the different fabrics used! This is just a beautiful pattern! 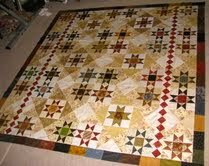 Congrat's to Sweet P and Becky~ and all the Eventide makers as all your quilts are certainly winners! I so enjoy looking at the pictures of the beautiful Eventide quilts! Everyone has their own look and each one is beautiful! 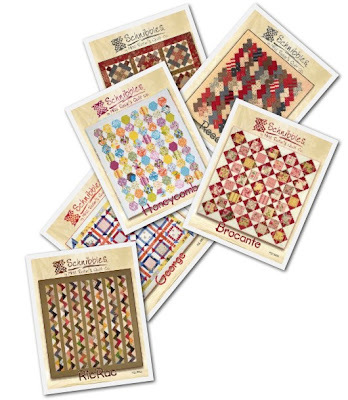 I truly agonized over my decision not to participate in the Eventide quilt along and have added it to my Shoulda-Woulda-Coulda list along with the Red and White Snowball quilt. I love seeing the various fabric choices and look forward to the big reveal next month! Everyone's Eventide looks wonderful. You are all to be congratulated on making a beautiful quilt. I wish I had had time to participate. I love those fabrics!!! How lucky would it be to win them. What beautiful quilts! Somehow I missed your quiltalong but it looks like it was alot of fun. Just found your blog today, and have been here for over an hour! Love everything, and all the Eventide quilts, and the blogs of the participants, too. I'm so inspired! Will definitely return, have marked you in my favorites, and would love to be entered in the giveaway. Thanks!! You are a terrible terrible influence :) I was at one of my LQS (and isn't it interesting how the definition of "local" changes when there's fabric involved?) and I was scanning the rack for "Brown Eyed Girl" sine I'd been meaning to give it a try. And "Eventide" jumped into my handbasket! I'm not kiddng it *threw* itself in there. Along with some blue Rural Jardin FQs. So, count me in. I'm not sure if I'll make the deadline at this point but I made two Ohio Star blocks tonight and I'm in love with them. So even if I don't make the parade I'll love the results.